Dark auburn brown color, and medium texture. Mulch can be installed by us or delivered for your own installation. Contact us for our price for mulch installation. Delivery service is dependent on amount requested and delivery location. Color-enhanced substitute for Hardwood mulch. This shredded hardwood product has been colored with a long-lasting brown color. with a long-lasting red color. All wood, no bark or dirt, good when you need clean chips. Walker Landscape and Lawn Care does not carry mulch at our location but we purchase our mulch from the best suppliers to be used in our mulch installations. Mulch can be delivered for your own installation if you enjoy doing your own mulching. 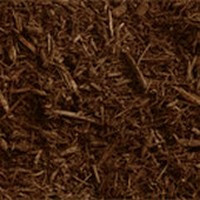 We purchase in bulk but bagged mulch can be purchased on select varieties and delivered. Dyed Mulch-Black, Brown, and Red. (Will stain hard surfaces, if delivery of these products is requested we suggest to place a protective cover down where delivery is to be placed to avoid staining such as driveways. Color-enhanced substitute for Hardwood mulch. This shredded hardwood product has been colored with a long-lasting black color.